CHNEP Environmental Education Workshop. Photo by Annisa Karim. Please send this message to others you think may have an interest in attending. Requirements by NAI for the CIG Course: Anyone age 16 or over with a desire to increase their knowledge and skills related to interpretation may participate. 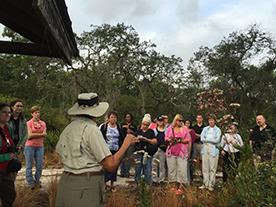 Requirements by CHNEP for this course: This training is offered to those whose work (paid or volunteer) somehow helps protect the natural environment of southwest Florida, thereby helping to fulfill the CHNEP plan to protect the environment. We ask everyone who applies to complete a project that furthers the CHNEP plan to protect the environment as defined by CHNEP (http://www.chnep.org/CCMP/CCMP2013.pdf) by Dec. 31. You are asked to submit a report and any products prepared to CHNEP by Dec. 31. Process and Costs: This is a two-step registration process -- first with CHNEP (using the form at http://certifiedguidetraining.eventbrite.com then with NAI. When you register with NAI, payment to them will be required. The CHNEP will review all requests received by Monday, May 16. Those accepted will receive an email message from maran@chnep with registration guidance for NAI. If space is available after May 16 and more requests are received, the CHNEP will again review all requests received by June 13. It is CHNEP's hope that the 30 places available will be taken by those who will commit to a project that somehow furthers the CHNEP. The CHNEP, with support from Florida Aquarium and Sarasota County, is underwriting the cost of this course ($380+) except annual membership to NAI ($150) and certification ($10). Lunch will be provided each day but your time, travel and any other expenses incurred will not be covered. To be considered, complete the registration form associated with this event. You may wish to have some of your responses already written so that you may copy and paste them into the form. Remember, by registering on this page you are only letting CHNEP know of your interest in attending this training. You will also be required to follow the NAI registration process.